Soon to be Christmas, friend Lindsay wrote on the invitation to her annual craft fair. Once visitors have admired her exquisite silver jewelry, she plies them with mulled wine and her famous mincemeat tarts with brandy butter. Lindsay may be the only Canadian cooking from scratch this holiday season. With all the festive snacks, appetizers, mains and desserts filling supermarket shelves, entertaining friends and family has never been easier. Here’s a taste of some of the new store-bought products I’ve tried and enjoyed. Since I’ve only ever bought shampoo at Walmart, their Our Finest holiday collection was a revelation. Seems a lot of well-to-do people shop at the discount giant, so the quality has to be high. Nobody will guess these mini cream puffs filled with real whipped cream came frozen in a box. At $5 for a 400 g package, they may be cheaper than making them yourself. Drizzle with chocolate if you feel the need to do something. Check out the Our Finest mini eclairs, too. Sure beats fruitcake! Among the frozen appetizers in Walmart’s 2012 holiday collection, these creamy little turkey and veggie tarts in a golden shortcrust pastry stole the show. Topped with crispy seasoned stuffing, there’s even a hint of cranberry inside. At 12 for $6, they’re a steal! Toronto chef, author and Food Network star Christine Cushing has added her fruity extra virgin Greek olive oil to a new line of frozen desserts. My favourite is the Radiant Lemon Fig Bundt Cake, which comes in a box of two adorable mini bundts. Defrost and enjoy their fabulous flavours with a cup of coffee or tea. For special occasions, dress them up with a dollop of Greek yogurt and fresh berries. Available at Loblaws and specialty food shops. Little black bags of roasted California pistachios are perfect for cocktail and Grey Cup parties. Wonderful’s new Salt and Pepper variety is even more addictive, with a hit of spice at the end. There’s Sweet Chili, too. 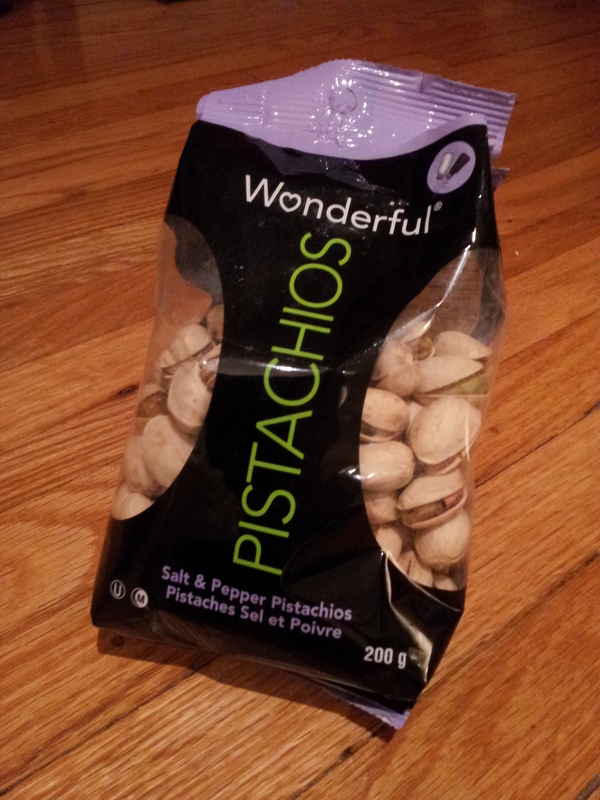 While I like the nutty, earthy flavour of Wonderful’s new Unsalted pistachios, those not on a salt-free diet may want to stick to the regular version. In the name of research I’ve also eaten half a bag of new Maple Bacon potato chips from President’s Choice. Dangerously delicious, they be. Among the many crackers out there, two new President’s Choice selections scored three stars at our house. Light and airy Sea Salt crackers, with their crisp texture and elegant ruffled edges, are perfect for cheese or pâté. PC’s Black Olive and Feta Crackers are another winner – mini baked pita bites to use as a dip, topping or any-time snack. Hello! What are you trying to do? Fatten me up more so with all these wonderful ideas for Christmas. How are you and Sandro doing? Hope that he is feeling good. Will be in Toronto for Christmas so hope to see you both for a few minutes or so. Much love.